Which president broke the law to prevent enslaved people from being freed? Who said, "When the president does it,that means it's not illegal"? Why does America have a president? From the heated debates among the framers of the Constitution in 1787 over an "elected king," to the creation of the presidency, and on through rich profiles of each man who has held the office, New York Times bestselling author Kenneth C. Davis takes readers on a guided tour of American history. Examining each chief executive, from the low lights to the bright lights, the memorable to the forgettable and the forgotten, Davis tells all the stories, offering rich anecdotes about real people. 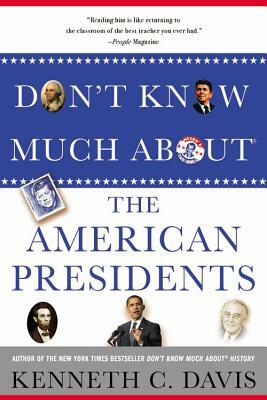 He also charts the history of the presidency itself, debunking myths and grading the presidents from A+ to F.
For history buffs and history-phobes alike, this entertaining book may change your understanding of the highest office in the land throughout more than two hundred years of history. Kenneth C. Davis is the author of Don't Know Much About® History, which spent 35 consecutive weeks on the New York Times bestseller list and gave rise to his phenomenal Don't Know Much About® series of books and audiotapes for adults and children. Davis, who is also the author of A Nation Rising and the New York Times bestseller America's Hidden History, has appeared on national television and radio, written for the Op-Ed page of the New York Times, and been a commentator on NPR's All Things Considered. He posts regularly at dontknowmuch.com and makes "virtual visits" to schools, libraries, and other groups around the country to talk about American history, the presidents, the Bible, the Civil War, and mythology, all subjects of his work. Kenneth C. Davis lives in New York City with his wife.